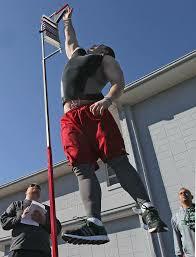 Just like the SAT or ACT, a football combine is a test—one that you can ace if you study hard. When combine day comes, how you perform six common key drills will be evaluated by recruiters to measure your athletic potential. Tip: When coming out of the starting blocks, keep your chin down to avoid rising up too quickly. If you stand up too fast, you will limit the power of your leg drive. Aim to stay low for the first 15 to 20 yards of the sprint. If you're like most high school footballers, you've probably worked on your blocking, tackling or catching, but not your ability to run in a straight line, unobstructed. So a little 40-specific training can go a long way. By improving your mechanics, flexibility and sprinting strength, you can realize a significant improvement in your time. Simple though it is, "The 40"—where you run 40 yards in a straight line as fast as you possibly can—is widely considered the most important drill at the combine. 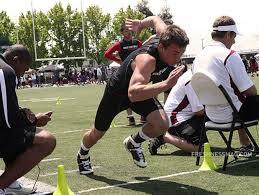 Shaving even one-tenth of a second off your time can catapult you from a preferred walk-on to Blue Chip status. But your finish time isn't the only thing you'll be evaluated on. Recruiters take three readings during the dash, looking for something different in each segment. At 10 yards: Here they are measuring your power, trying to see how quickly you get off the line. At 20 yards: Your time at the halfway mark shows your ability to accelerate. How long does it take you to reach top speed? At 40 yards: How you run the home stretch says a lot about your endurance. Once you reach full throttle, can you maintain it? Do you continue to speed up and close hard, or fade and slow down?